We start our vacation by boarding an international flight bound for Delhi, India, a land where the ancient and the contemporary exist side by side; where thousands of brilliant images fill the soul with wonder and where quaint and startling contradictions are juxtaposed to lend an extraordinary vitality, texture and poetry to life. Meals and snacks will be served on the plane. 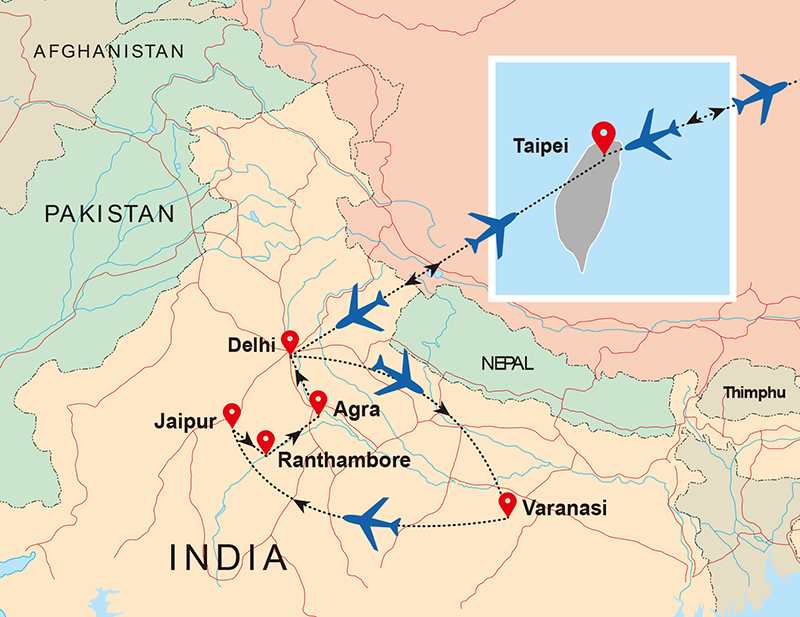 On arrival at Taipei, we’ll transit and board our connecting flight to New Delhi. Board a shuttle bus to overnight hotel. In the morning, we will return to Taipei Airport and fly to Delhi. Delhi is India’s capital and a major gateway to the country. Perhaps there is no other capital city in the world so steeped in history and legend as Delhi. It was the magnet that attracted the Mongols, Turks, Persians, Afghans, Mughals and the British to India, all of whom contributed to its glorious but turbulent past. The fascination with Delhi was such that even though it was abandoned many times, its rulers returned to it again and again and rebuilt it at least seven times. Today, the twin cities of Old Delhi and New Delhi still intrigue Indians and tourists alike as the cultural and political capital of the largest democracy in the world. Arrival in Delhi, we will go through the Immigration & Customs formalities. Meet up with our guide & transfer to hotel. We will rest for the day. We will have a City Tour of Old Delhi. Old Delhi was the capital of Mughal India between the 12th and 19th centuries. Visit the 17th century Jama Masjid and walk through the narrow, winding lanes of colorful and bustling Chandni Chowk. We will take a rickshaw ride through these bazaars. This afternoon we will have a City Tour of New Delhi. First stop is the India Gate, a memorial honoring the 70,000 Indian soldiers who lost their lives fighting for the British Army during World War I and 13,500 British and Indian soldiers killed in the 1919 Afghan war. We then drive along the Rajpath, passing the Parliament House and secretarial buildings. Next, we’ll head to Qutub Minar, site of the 12th century tower of victory built by a slave king and prototype of all minars (towers) in India. It became a UNESCO World Heritage Site in 1993. 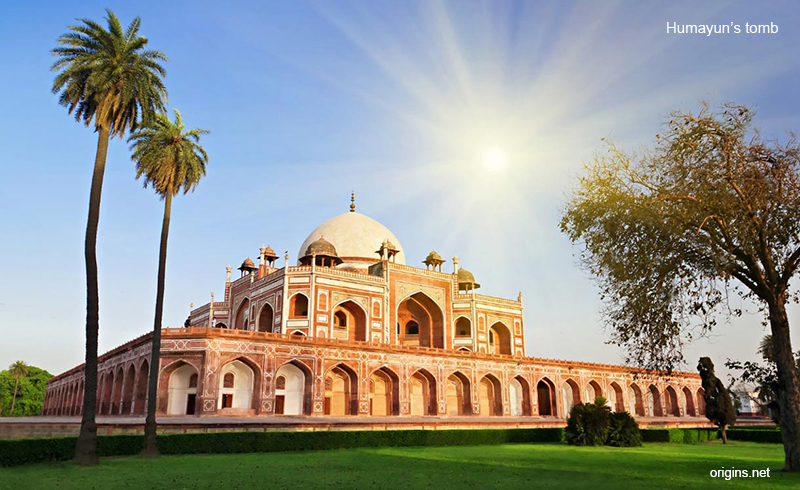 Our last stop will be the 16th century Humayun’s Tomb, another UNESCO World Heritage Site and a precursor to the Taj Mahal. Today, we will transfer to the Airport and fly to Varanasi. The ‘eternal city’, Varanasi or Benares, is one of the most important pilgrimage sites in India. The Ganges, which flows through the city, is believed to have the power to wash away the sins of mortals. For the Hindu, the city has always been special and is considered a particularly auspicious place to die because it ensures instant entry into Heaven. Upon arrival, we will transfer to the hotel and check-in. In the evening visit the Ganga Ghat to see the Aarti, a Hindu religious ritual of worship, a part of puja, in which light from wicks soaked in ghee (purified butter) or camphor is offered to one or more deities. We will stay overnight in Varanasi. We take an early morning Boat Ride on the Ganges River to see the Bathing & Cremation Ghats. Then we will return to our hotel for breakfast. After breakfast, we have a City Tour of Varanasi that includes Bharat Mata Temple, a holy shrine that is dedicated to Mother India; Tulsi Manas Temple, one of the most famous temples of Varanasi and an important tourist attraction of the holy city; and Banaras Hindu University, a public central university and is one of the largest residential universities in Asia, with over 20,000 students. Pure vegetarian lunch will be arranged today. Later, we will proceed for guided Bengali Tola Walk tour. It’s an excellent opportunity for us to get a glimpse of the symbiotic life of the riverside people of Varanasi. On the street of Bengalis, we will visit the hidden Mother Goddess Kali Shrines, the historic ritual bathing site called Dashashwamedh Ghat or the ten-horse sacrifice Ghat. After breakfast, we will visit Sarnath, near Varanasi where Lord Buddha preached his first Sermon and spend time in the Sarnath Museum which houses findings and excavations of Sarnath. See the many stupas, ruins and Mutagandhakuti Vihara, containing relics found during the early excavations of the buried city. While returning to hotel, visit the weaver’s district it is like stepping back in time. The weavers use various techniques that are very specific and traditional, being in their culture for centuries. The clapping sound of the old fashioned weaving looms echoes in and around the narrow lanes of the tightly packed houses. Today we transfer to the airport for our flight to Jaipur. Jaipur (City of Victory) was founded by Maharaja Sawai Jai Singh II in 1727. It is called the Pink City of India and is the only city in the world symbolizing the nine divisions of the Universe through nine rectangular sectors sub-dividing it. The architect who designed the layout of the city based it on the Shilpa Shastra, the epic Hindu treatise on architecture, mixing it with the sublimity of the Mughal and Jain influences of those times. Upon arrival, we will proceed to our hotel and check in. Free leisure time for the rest of the day. This morning we will visit the Amber Fort, the former seat of the Rajput rulers of Jaipur. Like the 18th-century Palace of Winds, the screened windows of the Amber Fort allowed the ladies of the court to view processions, civic activities, and formal matters of state without being seen. 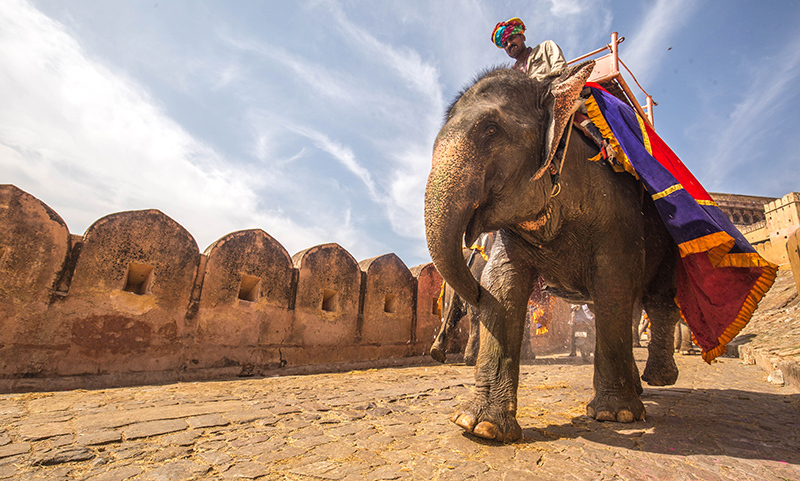 We ascend the slope to the fortress in royal style, seated on Elephants, and then wander through the temple and beautiful palaces within the walls of the fort. We will return our hotel after visiting the fort. In the evening we will visit the Colorful City Market. During the visit we will observe the local artisans in their workshops: jewelers and silversmiths, gold and silver foil makers. We have the option of trying the art of Henna Tattoo Painting here. After breakfast, we’ll visit the City Palace known for its blend of Rajasthani and Mughal architecture. Not far away is Albert Hall Museum (Central Museum) that has a large collection of woodwork, jewelry, costumes, brassware, and pottery. Another monument near the City Palace is Jantar Mantar, a UNESCO World Heritage Site designated in 2010 and the largest of the five observatories built by Sawai Jai Singh. The Hawa Mahal or the Palace of Winds was constructed for the royal ladies to watch the royal processions without being seen. After breakfast, we will drive to Ranthambore. The national park boasts a spectacular landscape filled with boulder, highland plateaus, lakes, and rivers. With some old forts and abandoned mosques, this creates a wonderful atmosphere for both bird and mammal viewing. Perhaps the most famous is the “Project Tiger” reserves. It is the best place in India to spot some Bengal Tigers. After lunch, visit the Ranthambore Fort. It is located within the Ranthambore National Park. The park is the former hunting grounds of the Maharajahs of Jaipur until the time of India’s Independence. It is a formidable fort having been a focal point of the historical developments of Rajasthan. The fort was held by the Chahamanas (Chauhans) until the 13th century, when the Delhi Sultanate captured it. Early morning, proceed to Ranthambore National Park and enjoy the game drive. The park is one of the finest tiger reserves in the country where visitors are likely to spot one of these majestic animals. Apart from tiger you can see herds of Chital and Sambar deer, wilk boar, Nilgai antelope and chinkara gazelles. We will return to hotel for lunch. Later that day, proceed for the afternoon game drive. After breakfast, we will drive to Agra, passing some incredible scenery. Agra was once a small village on the banks of the Yamuna River but was transformed into the second capital of the Mughal Empire – Dar-ul-Khilafat, or ‘seat of the Emperor’ in the 16th & 17th centuries by two great Mughal monarchs, Akbar and his grandson Shah Jehaninto. A world of contrasting edifices of red sandstone and white marble, narrow galleys, bustling streets and small buggies, Agra retains the irresistible charm that made this the favorite city of the Mughals. Upon arrival, check in our hotel in Agra. 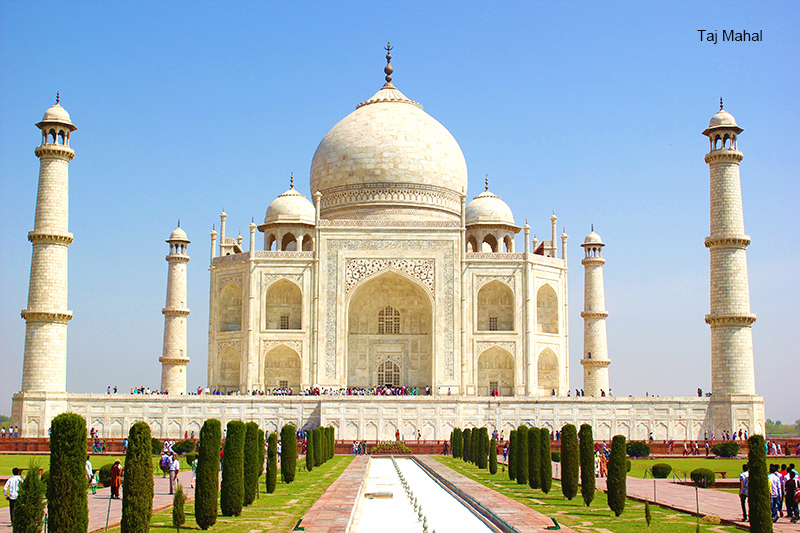 Early in the morning, we will take a tour of the Taj Mahal. We will take a bus part of the way and then ride Tonga’s “Horse Carriages” to the gates of the Taj Mahal. Designated a UNESCO World Heritage Site in 1983, it took 22 years and 20,000 men to build. The white marble was quarried 200 miles away and transported to the site by a fleet of 1000 elephants. Built by the Mughal Emperor Shah Jahan as an expression of his love for his wife Mumtaz Mahal in mid 17th century, the Taj Mahal is listed as one of the new Seven Wonders of the World. Then we will return to our hotel for breakfast. After breakfast, we will visit Agra Fort, a UNESCO World Heritage Site – the seat and the stronghold of the Mughal Empire under successive generations. 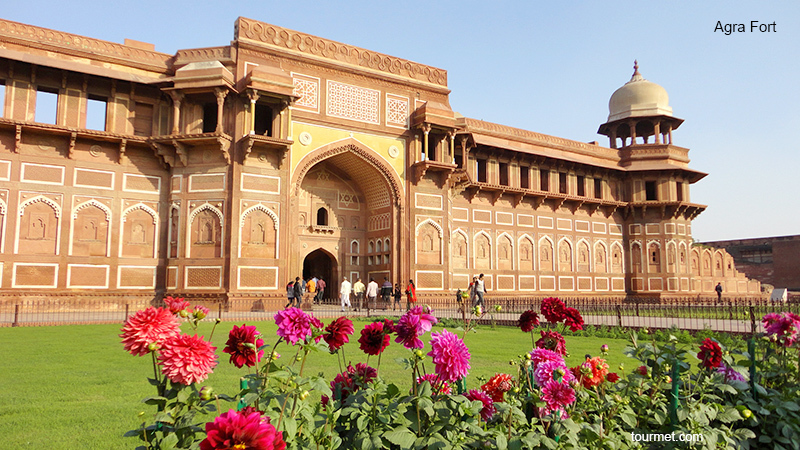 This was the seat of Mughal rule and administration and the present structure owes its origins to Akbar who erected the walls and gates and the first buildings on the eastern banks of Yamuna River. Shah Jahan added the impressive quarters and the mosque while Aurangzeb added the outer ramparts. Visit its Hall of Public Audience and its Royal Pavilions. During the tour we will also experience a short Tuk Tuk Ride. This morning, we will visit Itmad-ud-Daulah’s Tomb, often referred to as “Baby-Taj”. It was also known as a jewel box because of its white marbled walls of the tombs and semi-precious stone decorations including onyx, topaz, and jasper. Later that day, we will drive to Delhi. Upon arrival, check-in for our stay. Free leisure time for the rest of the day. After breakfast, we visit Swaminarayan Akshardham Temple. The Temple reflects the essence and magnitude of India’s ancient architecture, traditions, and timeless spirituality. Akshardham means the eternal, divine abode of the supreme God. After lunch, we will enjoy some leisure time. In the late morning, we will transfer to airport to fly home via Taipei. Stay overnight in Taipei. Fly home and overnight on the plane. Enjoy some shopping before flying back to Honolulu. This ends our amazing fabulous trip to India. CHECK OR CASH PAYMENT ONLY. A deposit of $500 per person is required at the time of application. The balance of payment is due Aug.03, 2019. In case the balance of payment is not made within the required time period, Air and Sea Travel Center reserves the right to cancel reservations and charge a service fee for cancellation. ** From Sep.21, 2019 to departure or withdraw during the tour shall be regarded as willingly give up all rights concerned, 100% of total price, and request for the other service as substitute shall not be accepted.